L-INK #16 (11/04/2019): A NEW BEGINNING! Work is keeping me very busy, but to prove I’m still around here’s a quick blog post, taken from the top of my pile of unfinished blog posts. 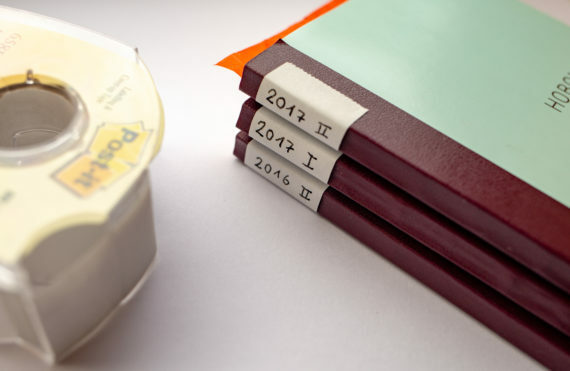 Just a quick look (not a proper Handicraft post) at how I label old Hobonichis, so that I can see the year from the Techo’s spines, i.e. without having to take them from the shelf. I love Post-its on a roll. 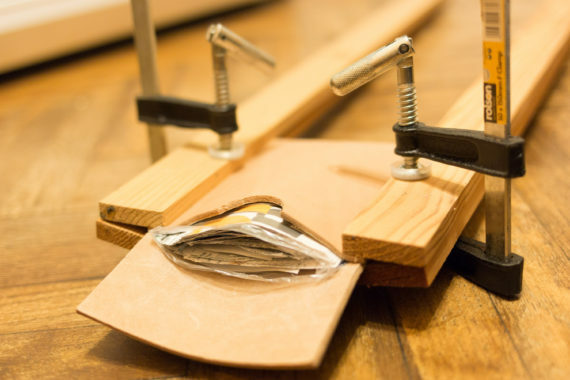 Not cheap, but very useful. Even though Post-its are supposed to be reusable I often use Post-it tape for permanent labelling. In this case I just used white tape and make sure the labels are all at the same height by applying the label on the new Techo when holding the previous year’s Techo next to the new one. 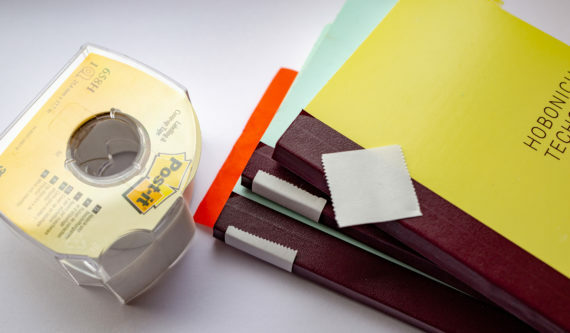 If it comes off you could prefold the tape to make sure there’s a proper 90 degree angle where the cover meets the spine and/or use longer tape so that it has more area to ‘grab’ the cover. I should add that to the blog post. 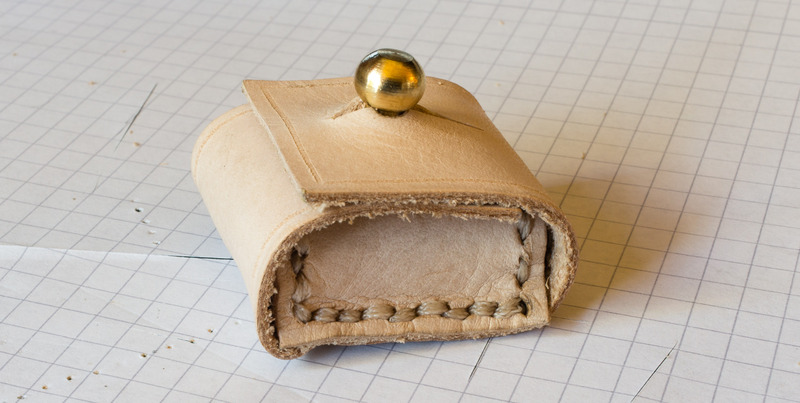 In the previous handicraft blog post I followed Gunther’s instructions and made a leather case for the Pollux. This was easier than I thought. Putting the case together would have been very fast if it wasn’t for getting the needle through the holes in the leather, when sewing different patches together. That took quite a while. Exited by the fact that the material wasn’t to expensive while the outcome was quite usable I thought I try to make another ‘leather item’, but this time something bigger. 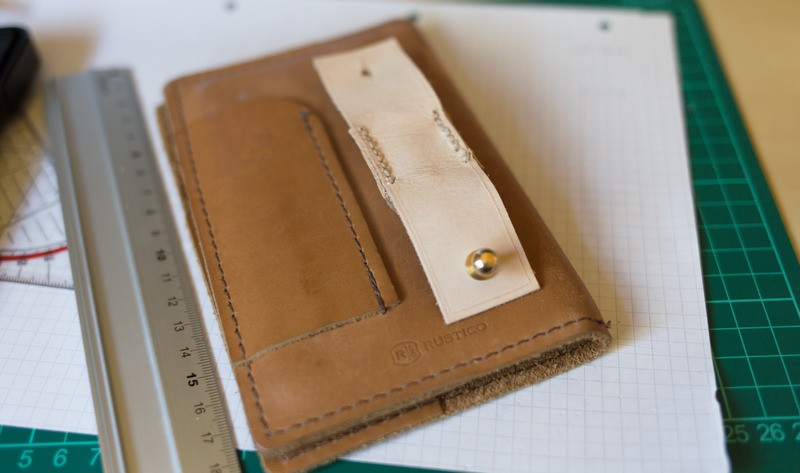 One of the leather items I am using frequently is a Rustico Field Notes leather cover. 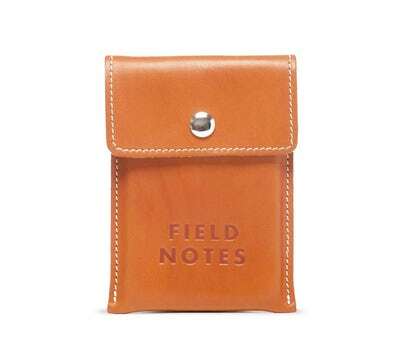 It’s great, but doesn’t hold as many Field Notes memo books as I have in use1 – so another, bigger case/pouch would be quite useful to me. There is an official Field Notes leather pouch, called Pony Express, but by the time it is imported into the UK it is rather expensive (>£80). 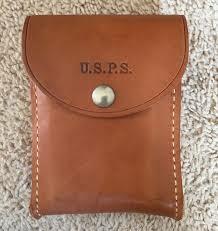 This pouch is based on a leather pouch from the United States Postal Service. Trying to make a similar case seemed like a good idea. 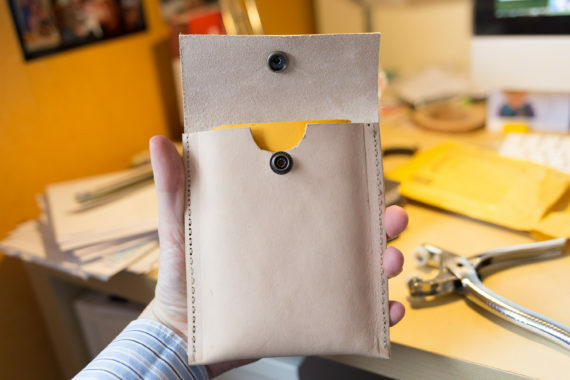 The choice was to either make a very similar pouch to the USPS or FN version (using modern language I would call it ‘portrait mode’) or to do a ‘landscape version’ with slits in the back so that it can be easily attached to a belt. I went for the ‘portrait’ version, mainly because it seemed cheaper to get a piece of leather to fit this version, but also because I thought it would be rather unlikely that i would carry the ‘landcsape’ version on my belt. The size of leather I needed was just a bit bigger than one I saw on eBay, but luckily eBay seller leatherandstuff-shop was happy to accommodate me: size-wise the closest patch of leather they sell is 30cm x 30cm, but they were happy to accommodate me and send me 35cm x 25cm for the same price (I need 35cm length for the pouch to work). 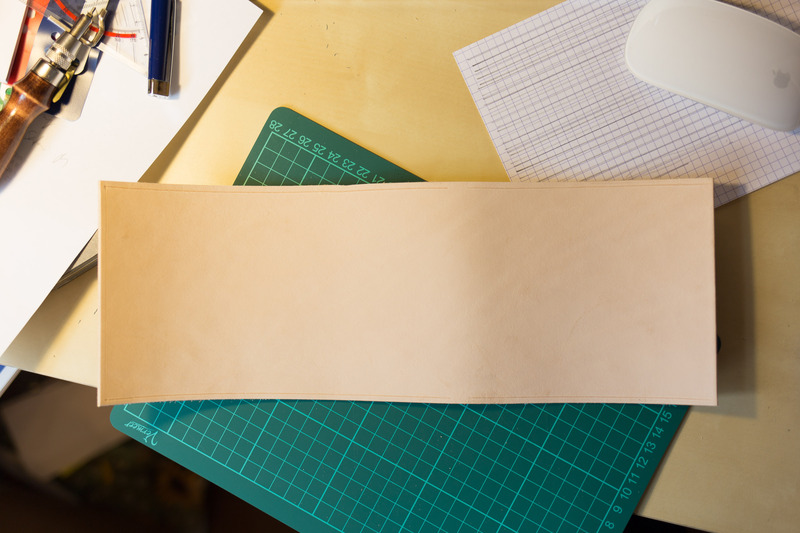 As the length, not the width, of the patch needed was the issue I had more material than needed and just cut the leather I bought in half, meaning that for the £11.95 I spent I can make a second pouch. Once I got to the stage where I had to get the needle through the holes things got very slow again2, even more so because this time I used thicker leather (officially 3mm, but actually 4mm thick), so getting the needle through the holes was just too difficult. To speed things up I went to the garage and got my variable-speed rotary tool (i.e. a no name Dremel copy) to enlarge the holes. Thanks to this tool enlarging/making the holes was very fast and getting the needle (and the thick thread) through was easy, but I’m not sure whether this is a recommended way of making holes. I don’t know much about working with leather, so who knows, maybe these kind of holes will rip out easily, unlike traditionally made holes. The point I want to make is: it worked for me, but this might or might not be a good way of doing it, I don’t know. It was however an easy way of doing it. After I finished sewing the pouch together I was trying to get it into shape: instead of being very flat I want it to bulge out in the middle part, to make it easy to put the memo books in and to take them out, especially because the leather is so thick and inflexible. I read that you can mould leather when it’s wet, so I held the case under a water tap. 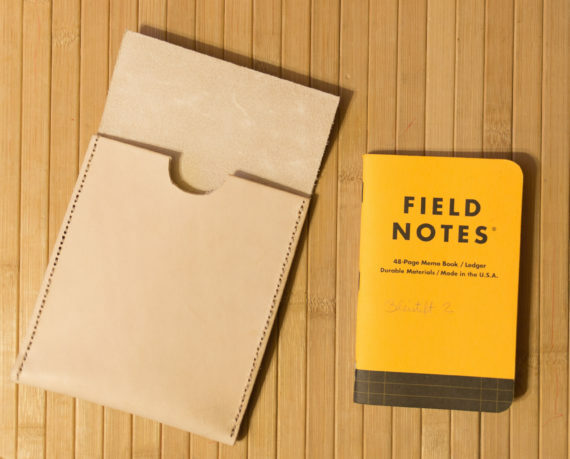 I then put a plastic bag insert in, made from cut up packaging material, but because I didn’t trust the insert to be completely water and condensation proof I didn’t dare to put my real Field Notes memo books in. Instead I filled it with paper of the same size as Field Notes memo books. 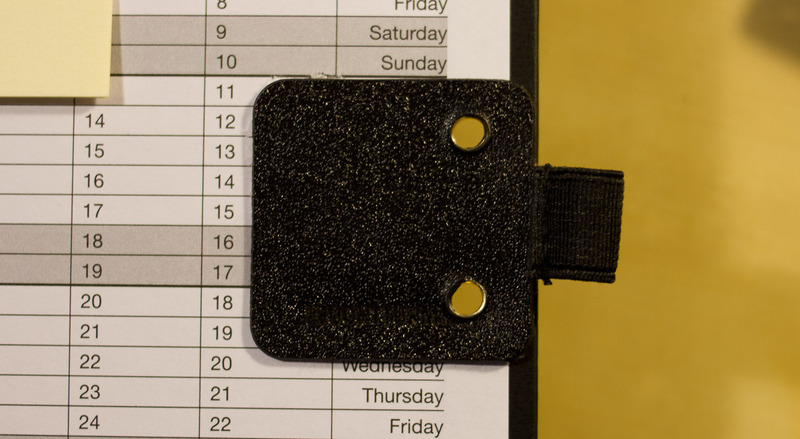 Afterwards the sides of the case were clamped down, so that only the middle part gets bulged out, not the whole case. This setup dried overnight and the case was nearly ready, I used some leather balm after the water torture and then I just had to wait a few more days for the push button for the flap to arrive, two were £1.79. Attaching it was slightly messy, just because I didn’t have the right tools, but in the end it all worked out. ..and here is my finished case. I have been using it for over a month now. It still has a strong leather smell, not sure when that will go away, but it is very sturdy and practical. 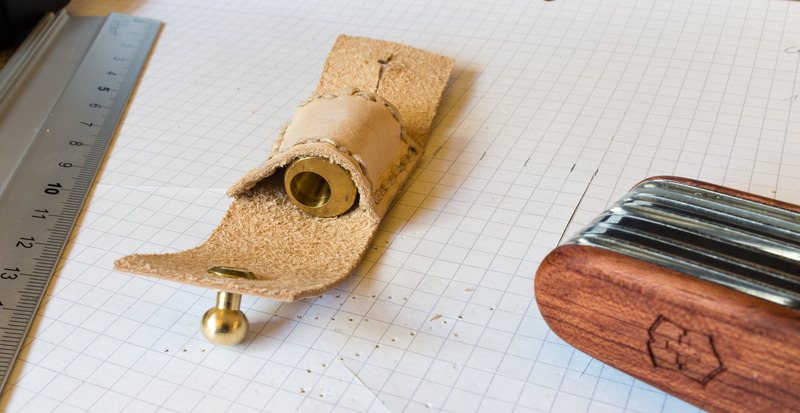 Time for another Handicraft with Bleistift post. Since we’re talking about Handicraft posts anyway, my 2010 Handicraft post contained the sentence “my point protector is so simple, you probably thought of it yourself somewhen in the past” – well, there’s proof that people come up with the same idea1, there’s a video on YouTube by tintinonair, explaining how to make these pencil point protectors. 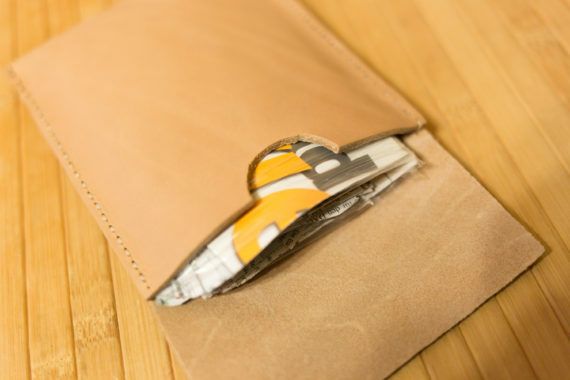 You might have seen Lexikaliker’s posts about his Pollux cases, first in Basteln mit dem Lexikaliker (14), then a different version in Basteln mit dem Lexikaliker (15). Well, I went with the more traditional, original version from Basteln… (14). 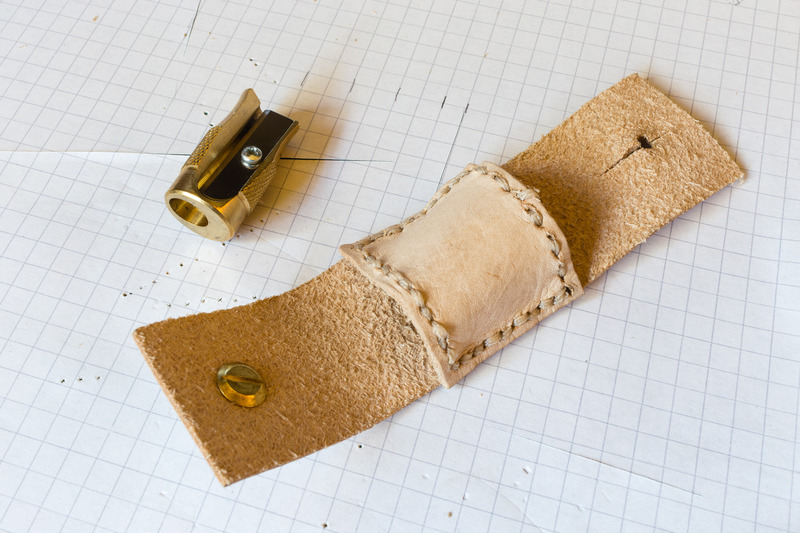 I have never worked with leather before and don’t have much DIY/craft experience or skills in this area, but Gunther’s drawing and measurements make it very easy to copy his design, which is similar to the leather case you get with the DUX Adjustable Brass Pencil Sharpener DX42774. Me being inexperienced the whole thing took over an hour, but the time was mainly spent on trying to pull the needle through the holes, using the pliers from my Swiss Army Knife. Doing the threads both ways, i.e. after sewing through the holes going through them in reverse again, so that the thread is also between two holes on the opposite side of the leather (I bet there’s a word for this) didn’t help speeding things up either. Well, I was well entertained, listening to our favourite Scouser’s (Craig Charles) House Party. By the way, Craig Charles previously featured in this blog post. While listening I once thought Arrested Development were singing ‘disrespecting my Blackwing’, but it turns out they were singing ‘disrespecting my black queen’. 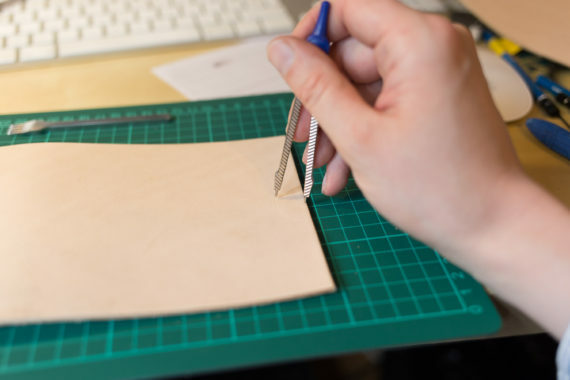 Well, the main thing I learned, other than paying more attention to song lyrics, is to try to cut the leather deep enough the first time as the knife I used to cut the leather was so sharp, when cutting a second time the blade won’t end up in the old, but will cut a new ‘channel’. One thing to do for next time is to get a smaller needle and thinner thread. When I compared the thread to the one on my Rustico I saw that mine is much thicker. With a thin thread and needle the whole ‘pull the needle with pliers, like an ox’ part could have been skipped. I love the look of vegetable tanned leather and how it slowly changed colour over the years, getting much darker. 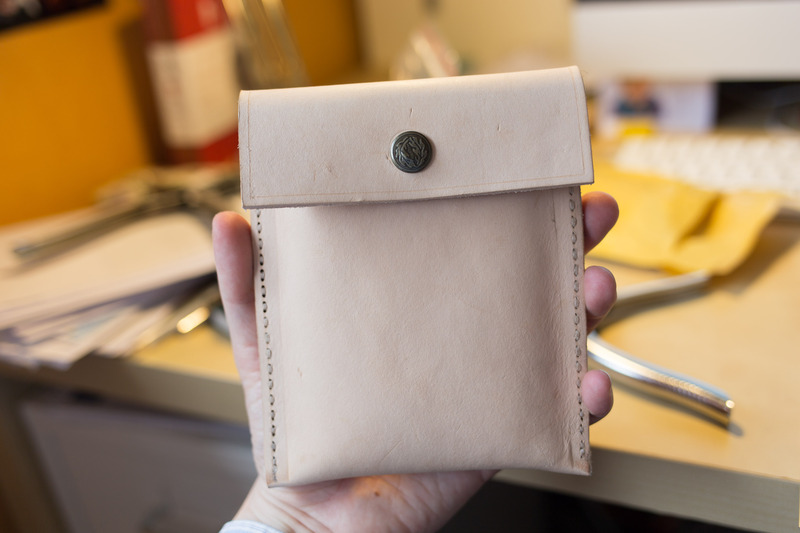 The leather cost me £2.25, but there’s enough left to make two more cases. As for the rivet.. unfortunately, I had to buy ten (for £5.49), so I hope I can find a use for the other nine. I would like to thank Gunther from the Lexikaliker blog for his great plan on how to cut the leather for this case. 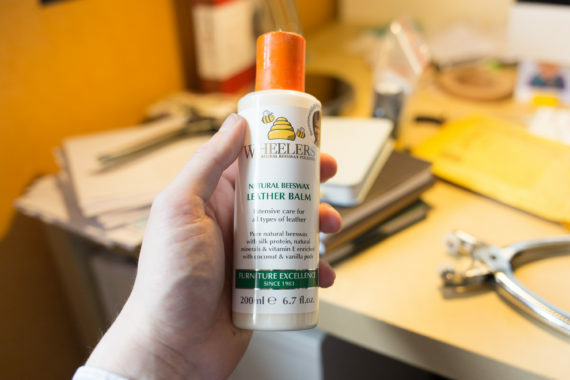 You can see the colour of my Rustico case, when it was new, in this blog post. 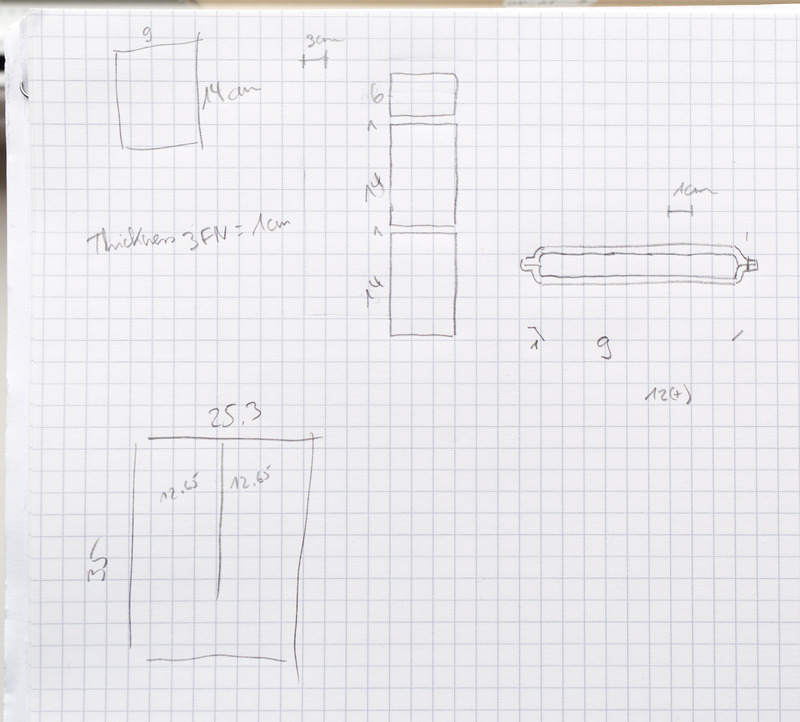 Today: a short video with some high tech pencil sharpening, showing how to sharpen a pencil with a hard disk. It’s Handicraft with Bleistift VI. 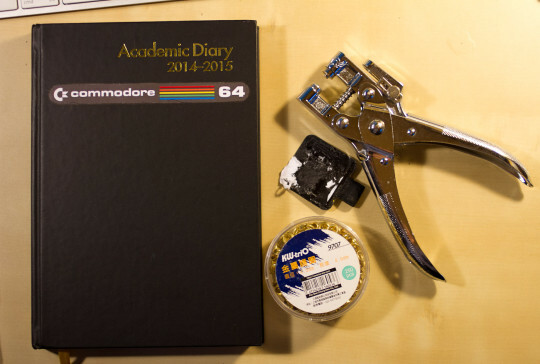 ..you could use a similar set up for grinding fountain pen nibs. It might be worth making a backup of the contents of your hard disk before converting it into a pencil sharpener. 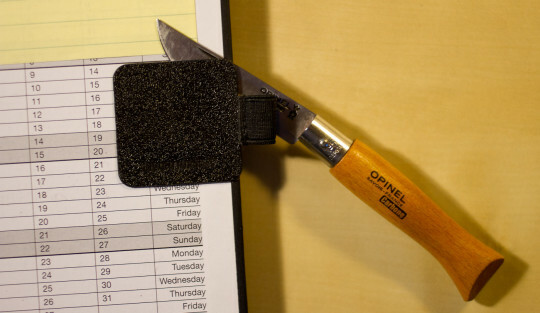 After my initial disappointment with Leuchtturm’s pen loop, my pen loops caused problems because of protruding plastic with glue at the bottom, I adjusted my pen loops by cutting the bit of the plastic off that put glue on the pens put in the pen loop and that scratched their surface. 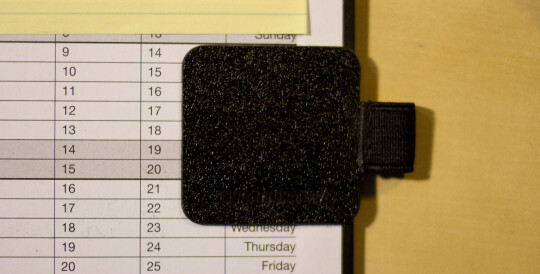 I wonder whether the pen loop has improved since 2011, maybe the problem is gone from later version of Leuchtturm’s pen loop. I haven’t found out yet because I haven’t bought new ones, but reused my old pen loops, as you might already have seen in this blog post. This weekend I have reused the last of my original pen loops, so I took some photos along the way. Leuchtturm’s pen loop in my old diary. Removing the old pen loop. The glue is quite something. I’ll attach it to the new diary with a paper riveter I bought in Shanghai many years ago. ...to receive notifications of new posts.